Each year, The College of Fellows of the Royal Architectural Institute of Canada (RAIC) bestows Fellowship in recognition of outstanding achievement. Among 2016’s 41 new Fellows is our very own Toon Dreessen, OAA, AIA, LEED AP. 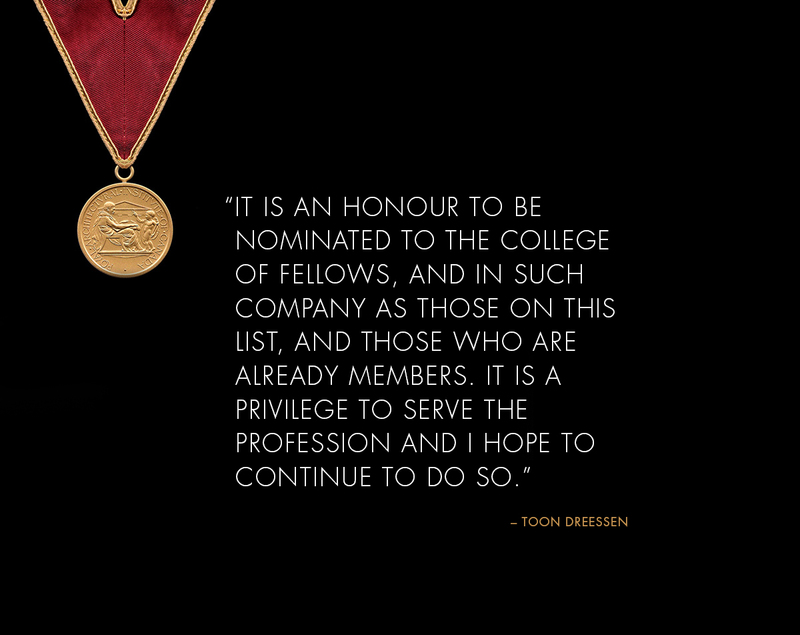 The criteria for Fellowship include design excellence, exceptional scholarly contribution, or distinguished service to the profession or the community. Toon has a long history of serving the profession of architecture including his current position as President of the Ontario Association of Architects (OAA). From 2000 until 2006 Toon served as a board member and chairman of the Students Design Clinic, a company managed by Carleton University students to give them exposure to practice; in 2006 he served on the OAA’s Practice Committee until being elected to Council in 2012. In 2013, Toon was elected to the role of Vice President, Communications (OAA) and in 2014, was elected to the role of Senior Vice President and Treasurer (OAA), and since 2013, he has represented the OAA on CExAC, the Committee that administers the Examination for Architects in Canada. He has been involved in many committees of the OAA, primarily focusing on communication, advocacy, and member services. Toon was elected President of the OAA in January 2015 and was acclaimed to the role for a second year in January 2016. A graduate of Carleton University, recipient of the Alpha Roh Chi medal, and two-time winner Ron Brand Memorial Scholarship, Toon is now President at Dreessen Cardinal Architects Inc., an Ottawa architectural practice with 10 employees which has evolved through Toon’s vision since 2005. Toon has amassed significant experience in industrial, institutional, residential, mixed use, infill development, retail and office spaces, , blending a highly technical understanding of details with a refined design language that results in award winning projects. Fellows will be inducted at the College of Fellows Convocation, which takes place during the RAIC’s Festival of Architecture in Nanaimo, BC, June 8 to 11. See a full list of this year’s 41 Fellows HERE.